ميدفورد (بالإنجليزية: Medford, Oregon) هي مدينة تقع في مقاطعة جاكسون بولاية أوريغون في الولايات المتحدة. تبلغ مساحة هذه المدينة 66.67 (كم²)، وترتفع عن سطح البحر م، بلغ عدد سكانها 74907 نسمة في عام 2010 حسب إحصاء مكتب تعداد الولايات المتحدة. قام مكتب تعداد الولايات المتحدة بتحديد بيانات التركيبة السكانية لميدفوردفي تعداد الولايات المتحدة. في ما يلي، التركيبة السكانية حسب تعدادي 2000 و2010. The Census Bureau estimate for 2016 calculated an 8.9% growth in Medford since 2010 with 81,636 people in 29,751 households. Through 2015, the Census Bureau estimates that there were 7,427 محارب قديمs and 7.3% foreign-born persons. Among persons aged 25 or more, 86.4% had a مدرسة ثانوية degree or higher and 23.7% had a bachelor's degree or higher. Of people 16 or older, 61% of people held employment, and the median income was $41,931 (in 2015 dollars). As of the إحصاء السكان of 2010, there were 74,907 people, 30,079 households, and 19,072 families residing in the city. The كثافة سكانية was 2,911.3 نسمة لكل ميل مربع (1,124.1/كم2). There were 32,430 housing units at an average density of 1,260.4 لكل ميل مربع (486.6/كم2). The racial makeup of the city was 86.0% العرق والإثنية في تعداد الولايات المتحدة, 0.9% العرق والإثنية في تعداد الولايات المتحدة, 1.2% العرق والإثنية في تعداد الولايات المتحدة, 1.5% العرق والإثنية في تعداد الولايات المتحدة, 0.5% العرق والإثنية في تعداد الولايات المتحدة, 6.0% from العرق والإثنية في تعداد الولايات المتحدة, and 3.9% from two or more races. العرق والإثنية في تعداد الولايات المتحدة or العرق والإثنية في تعداد الولايات المتحدة of any race were 13.8% of the population. There were 30,079 households of which 31.9% had children under the age of 18 living with them, 45.1% were زواج living together, 13.1% had a female householder with no husband present, 5.3% had a male householder with no wife present, and 36.6% were non-families. 28.9% of all households were made up of individuals and 12.4% had someone living alone who was 65 years of age or older. The average household size was 2.44 and the average family size was 2.98. The oldest park in Medford, Alba Park is located at the intersection of Holly and Main in downtown Medford was deeded to the city by the railroad company in 1888. Known as Library Park after the 1911 construction of the Medford Carnegie Library, it was later renamed for Medford's توأمة مدن, ألبا. The park contains a gazebo, a statue of a boy with two dogs surrounded by a fountain pool, and a Japanese gun from World War II. The annual Pear Blossom Run ends across the street from Alba Park at the Medford city hall, with an all-day fair conducted in the park itself. مقالة مفصلة: Harry and David Operations Corp.
Medford is the birthplace of Bear Creek Corporation, known around the world for its fruit-laden gift baskets, especially locally grown pears. Tours of the plant are open to the public. At nearly 100 أكر (0.40 كـم2), this south Medford park is the second largest in the city (Prescott Park is the largest at 1,740 acres). 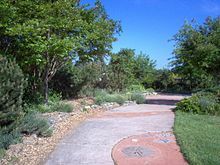 Bear Creek Park is bordered on the west by Bear Creek and the Bear Creek Greenway. On the park grounds are four tennis courts, a skatepark, a dog park, an مسرح روماني, a large ملعب أطفال, a BMX track, and a community garden. Since 1925, the property hosting Bear Creek Park has been used for several purposes. The first section was purchased from a resident of Medford named Mollie Keene. The town used it for ترميد النفايات until 1939. After that, it spent 20 years as a فتيات كشافة الولايات المتحدة day camp before seeing private ownership again for a few years. Concerns about pollution in the Bear Creek received media attention in 1963 and the city purchased more property. In 1988, a playground designed by Robert Leathers of New York was built. The Commons is a public park built in the city's historic downtown district adjacent to the Lithia Motors headquarters building. It has been used as a venue for community activities. It was completed in 2012. The cemetery, established in 1890, lies on 20 أكر (8.1 ها) just north of Bear Creek Park. It includes the grave of J. S. Howard and other former residents of Medford. The Parks and Recreation Department offers free tours of the cemetery. The Claire Hanley Arboretum was first planted in 1962 by Claire and Mary Hanley, two sisters raised on the السجل الوطني للأماكن التاريخية Michael Hanley Farmstead along present-day Oregon Route 238. It is part of a larger agriculture research center belonging to the جامعة ولاية أوريغون. Located on the grounds are species of the قرانيا قرانيا أوروبية, the dove tree, and the Sorrel tree. 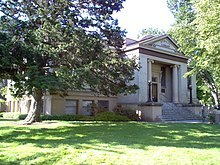 The Medford Carnegie Library is a two-story library building located in downtown Medford. It was erected in 1911 thanks to a gift from أندرو كارنيغي, but was vacated in 2004 after a new library building was constructed near the Rogue Community College extension campus, also in downtown Medford. Currently, there are plans to use the building for class reunions, public meetings, and for annexing some city offices from the neighboring City Hall building. One of Medford's most prominent landmarks, Roxy Ann Peak is a 30-million-year-old mountain located on the east side of the city. Its summit is 3,576 قدم (1,090 م) above sea level. It was named for Roxy Ann Bowen, an early settler who lived in its foothills. A significant area of Roxy Ann Peak (including the summit) is enclosed in Medford's largest park, a 1,740-أكر (2.72 ميل2; 7.0 كـم2) protected area called Prescott Park. The land was set aside in the 1930s and named in honor of George J. Prescott, a police officer killed in the line of duty in 1933. The most commonly used trail on Roxy Ann Peak, part of Prescott Park, climbs about 950 قدم (290 م) from the beginning of the footpath at the second gate to a height of about 3,547 قدم (1,081 م). The trail is about 3.4 ميل (5.5 كـم) one-way, and provides a panoramic view of the Rogue Valley. Finished in 1997 at the intersection of E. Main St and Central Ave in downtown Medford, Vogel Plaza has quickly become a center of activity for many local events. One such event is the annual Art in Bloom festival, which is held around Mother's Day each year. During the two-day festival, over 10,000 people attend and more than 75 artists showcase their work while surrounded by live entertainment, workshops, food, and children's activities. Medford is served by Medford School District 549C and has two main high schools and an مدرسة بديلة: South Medford High School, North Medford High School, and Central Medford High School, respectively. In addition to the two public high schools, Medford has several private high schools. Two of the largest are St. Mary's School and Cascade Christian High School. In addition, there are 14 public elementary schools and two public مدرسة ثانوية, (Hedrick and McLoughlin). Medford 549C has over 13,000 students enrolled اعتبارا من 2012[تحديث]. Crossroads School is a private, alternative high school operating in Medford along with three others operated or affiliated with a church; Cascade Christian High School, St. Mary's High School, and Rogue Valley Adventist School. Grace Christian and Sacred Heart School are private elementary and middle schools in Medford. In 1997, Grants Pass-based Rogue Community College (RCC) completed construction on a seven-building campus spanning five blocks in downtown Medford. Nearby Ashland-based Southern Oregon University collaborated with Rogue in 2007 on the construction of an eighth building which will offer third- and fourth-year courses to students. Pacific Bible College, formerly named Dove Bible Institute, was founded in Medford in 1989. The مكتب التحقيقات الفيدرالي publication "Crime in the United States" provides unranked statistical data from law enforcement agencies across the United States. The table to the right are statistics reported for the city of Medford for the years 2004 through 2007. As with any city that experiences rapid growth, Medford has seen a recent surge in gang activity and organized crime in the past decade. Methamphetamine use is a problem in Medford and southern Oregon and is believed to play a role in numerous property crimes, including identity theft. The Medford Police Department has 103 sworn police officers supported by a staff of 33 civilian employees and 30 volunteers. The official newspaper of Medford and Jackson County is the Mail Tribune, which is owned by GateHouse Media. It began circulation in 1909 after a merger between the Medford-based Mail and the Ashland-based Tribune. اعتبارا من 2004[تحديث], an average of 37,000 copies of the Mail Tribune are in circulation each day. In addition to having several athletes who were famous natives or residents of the city, Medford played host to several professional sports teams since 1948. It was the home city for several professional baseball teams, most notably the Medford A's, later known as the Southern Oregon Timberjacks, of the Northwest League. They were a short-season single-A minor league baseball affiliate of the Oakland Athletics who played at historic Miles Field from 1979 to 1999 before relocating to فانكوفر, British Columbia. There is currently talk about bringing an expansion franchise to Medford, but there is no suitable stadium to host such a team at the moment. The city of Medford is responsible for over 322 كيلومتر (200 mi) of roads within its boundaries. Interstate 5 runs directly through the center of the city. The section of freeway includes a 3,229-قدم (984 م) viaduct that elevates traffic above Bear Creek and the city's downtown.<ref name="ODOT Interstate">"The Interstate in Oregon". State of Oregon. اطلع عليه بتاريخ March 14, 2008. بلغ عدد سكان ميدفورد 984 نسمة بحسب تعداد عام 2000، وبلغ عدد الأسر 377 أسرة وعدد العائلات 275 عائلة مقيمة في المدينة. وتوزع التركيب العرقي للمدينة بنسبة 94.00% من البيض و 0.10% من الأمريكيين الأصليين و 0.61% من الأمريكيين ذوي الأصول الآسيوية و 0.10% من الأمريكيين الأفارقة و 0.81% من عرقين مختلطين أو أكثر. بلغ عدد الأسر 377 أسرة كانت نسبة 35.5% منها لديها أطفال تحت سن الثامنة عشر تعيش معهم، وبلغت نسبة الأزواج القاطنين مع بعضهم البعض 60.2% من أصل المجموع الكلي للأسر، ونسبة 8.5% من الأسر كان لديها معيلات من الإناث دون وجود شريك، وكانت نسبة 26.8% من غير العائلات. تألفت نسبة 21.8% من أصل جميع الأسر من أفراد ونسبة 10.6% كانوا يعيش معهم شخص وحيد يبلغ من العمر 65 عاماً فما فوق. وبلغ متوسط حجم الأسرة المعيشية 3.01، أما متوسط حجم العائلات فبلغ 2.60. بلغ العمر الوسطي للسكان 34 عاماً. وكانت نسبة 25.4% من القاطنين تحت سن الثامنة عشر، وكانت نسبة 10.6% بين الثامنة عشر والأربعة وعشرون عاماً، ونسبة 31.3% كانت واقعةً في الفئة العمرية ما بين الخامسة والعشرون حتى والأربعة وأربعون عاماً، ونسبة 23.2% كانت ما بين الخامسة والأربعون حتى الرابعة والستون، ونسبة 9.6% كانت ضمن فئة الخامسة والستون عاماً فما فوق. يوجد لكل 100 أنثى 103.3 ذكر، ويوجد لكل 100 أنثى في الثامنة عشر من عمرها فما فوق 106.2 ذكر. بلغ متوسط دخل الأسرة في المدينة 50,000 دولار، أما متوسط دخل العائلة فبلغ 55,714 دولار. وكان متوسط دخل الذكور 31,628 دولار مقابل 24,318 دولار للإناث. وسجل دخل الفرد الخاص بالمدينة 18,886 دولار. وكانت نسبة 3.3% من العائلات ونسبة 4.4% من السكان تحت خط الفقر، وكان من هؤلاء نسبة 1.1% تحت سن الثامنة عشر ونسبة 9.8% في الخامسة والستين من العمر وما فوق. بلغ عدد سكان ميدفورد 74,907 نسمة بحسب تعداد عام 2010، وبلغ عدد الأسر 30,079 أسرة وعدد العائلات 19,072 عائلة مقيمة في المدينة. في حين سجلت الكثافة السكانية 2,911.3 نسمة لكل ميل مربع (1,124.1/كم2). وبلغ عدد الوحدات السكنية 32,430 وحدة بمتوسط كثافة قدره 1,260.4 لكل ميل مربع (486.6/كم2). وتوزع التركيب العرقي للمدينة بنسبة 86.0% من البيض و 1.2% من الأمريكيين الأصليين و 1.5% من الأمريكيين ذوي الأصول الآسيوية و 0.5% من سكان جزر المحيط الهادئ و 0.9% من الأمريكيين الأفارقة و 3.9% من عرقين مختلطين أو أكثر. بلغ عدد الأسر 30,079 أسرة كانت نسبة 31.9% منها لديها أطفال تحت سن الثامنة عشر تعيش معهم، وبلغت نسبة الأزواج القاطنين مع بعضهم البعض 45.1% من أصل المجموع الكلي للأسر، ونسبة 13.1% من الأسر كان لديها معيلات من الإناث دون وجود شريك، بينما كانت نسبة 5.3% من الأسر لديها معيلون من الذكور دون وجود شريكة وكانت نسبة 36.6% من غير العائلات. تألفت نسبة 28.9% من أصل جميع الأسر من أفراد ونسبة 12.4% كانوا يعيش معهم شخص وحيد يبلغ من العمر 65 عاماً فما فوق. وبلغ متوسط حجم الأسرة المعيشية 2.98، أما متوسط حجم العائلات فبلغ 2.44. بلغ العمر الوسطي للسكان 37.9 عاماً. وكانت نسبة 24.1% من القاطنين تحت سن الثامنة عشر، وكانت نسبة 9% بين الثامنة عشر والأربعة وعشرون عاماً، ونسبة 25.4% كانت واقعةً في الفئة العمرية ما بين الخامسة والعشرون حتى والأربعة وأربعون عاماً، ونسبة 25.3% كانت ما بين الخامسة والأربعون حتى الرابعة والستون، ونسبة 16.2% كانت ضمن فئة الخامسة والستون عاماً فما فوق. وتوزع التركيب الجنسي للسكان بنسبة 48.4% ذكور و51.6% إناث. ^ "Population Estimates". مكتب تعداد الولايات المتحدة. تمت أرشفته من الأصل في May 22, 2014. اطلع عليه بتاريخ 26 سبتمبر 2014. 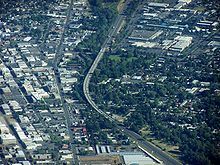 ^ "Quick Facts: Medford City, Oregon". census.gov. United States Census Bureau. اطلع عليه بتاريخ 02 ديسمبر 2017. ↑ أ ب "American FactFinder". مكتب تعداد الولايات المتحدة. اطلع عليه بتاريخ December 21, 2012. ^ "Medford Squibs". Democratic Times (جاكسونفيل (أوريغون)). Talky Tina Press. February 10, 1888. صفحة 2. اطلع عليه بتاريخ April 19, 2016. ^ "Appendix F: Priority maintenance projects" (PDF). City of Medford. اطلع عليه بتاريخ March 24, 2008. ^ "Alba Park". City of Medford. اطلع عليه بتاريخ January 18, 2008. ^ "Since You Asked". Mail Tribune. October 12, 2000. اطلع عليه بتاريخ January 18, 2008. ^ "Important Times". PearBlossomRun.com. تمت أرشفته من الأصل في December 13, 2007. اطلع عليه بتاريخ January 19, 2008. ^ "Harry & David | About Us". Bco.com. تمت أرشفته من الأصل في May 10, 2012. اطلع عليه بتاريخ September 15, 2012. ^ MailTribune.com: Roxy Ann shows her true colors in the spring نسخة محفوظة 02 يوليو 2017 على موقع واي باك مشين. ^ City of Medford Oregon – Bear Creek Amphitheater, Dog Park, Skate Park نسخة محفوظة 01 يوليو 2017 على موقع واي باك مشين. ^ Landers, Meg (July 26, 2005). "Creek Rubbish Resurfaces". Mail Tribune. ^ "Best Playground". Mail Tribune. October 26, 2008. ^ Cook، Dan. "Will Medford Ever Be Cool?". Oregon Business Magazine. ^ Yungen, John A. (March 1990). "Agronomic and Vegetable Crop Research, 1989" (PDF). جامعة ولاية أوريغون. صفحات 2, 41. اطلع عليه بتاريخ December 28, 2013. ^ Fattig, Paul (March 7, 2004). "Carnegie closes the book on 92 years of service". Mail Tribune. اطلع عليه بتاريخ March 3, 2008. ^ Landers, Meg (January 28, 2008). "Carnegie to rise from the ashes". Mail Tribune. اطلع عليه بتاريخ March 3, 2008. ^ "Roxy Ann is named for pioneer woman". Since You Asked. Mail Tribune. January 23, 2006. اطلع عليه بتاريخ February 19, 2008. ^ Young، Pete (April 15, 2008). "2008 Prescott Park Master Plan" (PDF). City of Medford Parks Commission. صفحة 10. اطلع عليه بتاريخ December 28, 2013. ^ "Roxy Ann". NGS data sheet. U.S. National Geodetic Survey. اطلع عليه بتاريخ December 28, 2013. ^ Miller, Bill (September 23, 2007). "A View of Roxy Ann Peak". Mail Tribune. اطلع عليه بتاريخ February 19, 2008. ^ "Activities". Mail Tribune. August 18, 2006. اطلع عليه بتاريخ February 19, 2008. ^ Briskley, Jill (March 16, 2003). "Rededication ceremony honors Medford's first traffic officer who was shot and killed". Mail Tribune. اطلع عليه بتاريخ February 19, 2008. ^ "Vogel Plaza". City of Medford. اطلع عليه بتاريخ January 18, 2008. ^ "Art in Bloom 2008". DowntownMedford.com. اطلع عليه بتاريخ January 23, 2008. ^ "Awards". Southern Oregon Arts Council. تمت أرشفته من الأصل في May 9, 2006. ^ "A Community Celebration". Art-in-Bloom.com. اطلع عليه بتاريخ January 23, 2008. ^ 8Nonpublics.pmd نسخة محفوظة 01 يوليو 2017 على موقع واي باك مشين. ^ "Proposal for a Minor Substantive Change" (PDF). Rogue Community College. April 2006. اطلع عليه بتاريخ January 23, 2008. ^ Darling, John (March 21, 2007). "RCC-SOU joint project breaks mold". Mail Tribune. اطلع عليه بتاريخ January 23, 2008. ^ "Pacific Bible College". تمت أرشفته من الأصل في December 7, 2009. اطلع عليه بتاريخ December 21, 2009. ↑ أ ب "Crime in the United States by Metropolitan Statistical Area". FBI CIUS 2007. مكتب التحقيقات الفيدرالي. اطلع عليه بتاريخ March 31, 2009. ^ "Crime in the United States by Metropolitan Statistical Area". FBI CIUS 2006. مكتب التحقيقات الفيدرالي. اطلع عليه بتاريخ January 29, 2008. ^ "Table 8 (Oregon): Offenses known to law enforcement". FBI CIUS 2005. مكتب التحقيقات الفيدرالي. تمت أرشفته من الأصل في February 27, 2013. ^ "Section II: Offenses Reported" (PDF). FBI CIUS 2004. مكتب التحقيقات الفيدرالي. صفحة 116. تمت أرشفته من الأصل (PDF) في July 9, 2013. ^ "Crime in the United States, 2006". مكتب التحقيقات الفيدرالي. تمت أرشفته من الأصل في February 9, 2014. اطلع عليه بتاريخ January 29, 2008. ^ "Variables Affecting Crime". Crime in the United States. Federal Bureau of Investigation. اطلع عليه بتاريخ December 28, 2013. ^ Burke, Anita (January 3, 2008). "Increased violence puts gang presence on radar". Mail Tribune. اطلع عليه بتاريخ January 23, 2008. ^ Conrad، Chris (June 8, 2009). "Medford sees 45 percent jump in drug arrests". MailTribune.com. اطلع عليه بتاريخ September 15, 2012. ^ "Medford Police Department". City of Medford. اطلع عليه بتاريخ April 10, 2018. ^ Stiles, Greg (August 2, 2007). "Future of Mail Tribune's unclear". Mail Tribune. اطلع عليه بتاريخ February 25, 2008. ^ Memmott, Mark (August 23, 2004). "Local media's clout rises in battleground states". يو إس إيه توداي. اطلع عليه بتاريخ February 25, 2008. ^ "Utility accounts". s City of Medford. اطلع عليه بتاريخ March 17, 2008. ^ "Interstate 5". State of Oregon Department of Transportation. اطلع عليه بتاريخ March 14, 2008. آخر تعديل لهذه الصفحة كان يوم 28 سبتمبر 2018، الساعة 13:42.